UPDATED: Wed., April 17, 2019, 2:01 p.m. If you thought Andrew Hozier-Byrne was a one-hit wonder with his 2013 breakout “Take Me to Church,” you’ve got some catching up to do. Hozier made sure the audience at his sold-out concert at the First Interstate Center for the Arts on Sunday knew he had plenty of other tunes in his back pocket, saving “Take Me to Church” for the end of the show. Having released his sophomore album “Wasteland, Baby!” in March, the Irish singer kicked off the show with a trio of tunes from the record: the rousing “Would That I,” “Dinner & Diatribes” and “Nina Cried Power,” which features Mavis Staples and was also featured on the 2018 EP of the same name. Staples wasn’t at the FICA on Sunday, but the song still felt like an audible sucker punch thanks to Hozier’s seven-piece backing band, all of whom contributed vocals during the song and throughout the night. 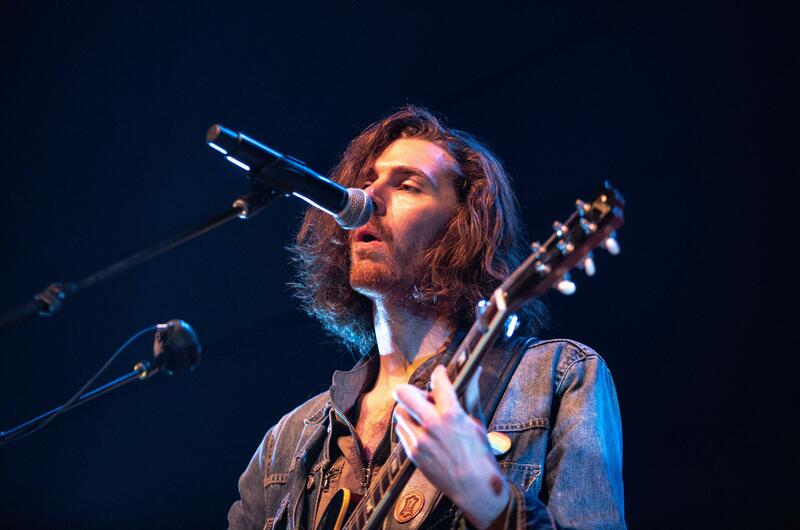 After mentioning how bittersweet this show was – the last on the current leg of his North American tour – Hozier jumped into “Someone New,” from his self-titled debut, showing excellent command as he moved in and out of his upper voice range with ease. Shrikes, also known as butcher birds, Hozier explained, park themselves near cacti or thorn bushes (“It doesn’t discriminate,” he said) and wait for mice or other small critters to get impaled before enjoying their catch. “It’s intelligent but also horrifying and gruesome so I thought that was an appropriate theme for a love song,” he said. Though slower, more somber tunes, “Wasteland, Baby!” and “Shrike” made for a fantastic one-two punch, with Hozier again showing his range on the latter song, which also featured beautiful violin work from Suzanne Santo. Hozier, again joined by the rest of the band, then picked up the tempo with “No Plan” from “Wasteland, Baby!” and “To Be Alone” from his debut album. Hozier wrapped up the main portion of his show with “Moment’s Silence (Common Tongue),” followed by “Movement” and, of course, “Take Me to Church,” which still had a lot of power despite how tired of performing the song I imagine the band must be. Afterward, Hozier introduced the band and thanked everyone on his team, from the tour manager to the production assistant to the merch person, for all their hard work and local singer Emily Ridler for opening the show. The show as a whole was an impressive yet humble display of the talented Hozier and his band. Images of windows were projected on stage throughout the show, and the lights changed dramatically at one point, but for the most part, Hozier and his band kept things simple, subtly giving naysayers a reason to check in on what they’ve missed since “Take Me to Church” ruled the airwaves. Published: April 15, 2019, 3:20 p.m. Updated: April 17, 2019, 2:01 p.m.